I'm working on a project for mid October and another committee member stopped by this morning with some information that was needed for the event. I find when one has mid morning or afternoon company, it's easier to offer a cup of tea rather than coffee. Some don't ever drink coffee, some drink coffee only in the morning, some only drink decaf. So many variables for a hostess. But I've yet had anyone turn down a cup of tea!!!! So when Sandy arrived, the kettle went on -- the tea tray was arranged and ready for the filled brewed teapot to be added. Once the tea was brewed, I carried the tray out to the sunroom where we commenced with our meeting. Once again it's the Johnson Brothers Indies. The wee teapot, sugar and creamer bought 16 years ago in England. I loved the bed/breakfast that we stayed in and all of them had a spot for making tea and I felt that my guest room needed that same amenity. Alas, that didn't last long for the teapot, sugar and creamer and the two cups and saucers I bought soon ended in the kitchen and were used daily for my afternoon tea. Two real English teaspoons (bought at a sale in a church in Lake Country), a pretty tea towel always makes a great tray mat, and for the nosh -- some Walker's Shortbread. Usually, I have a tin in the larder for I love shortbread. This past month it's been a huge tin because they have been my afternoon nosh -- not able to bake cookies! The meeting went well -- it always does when refreshments are involved! It's Tuesday which means that it's Tea Party Tuesday so please join these lovely ladies to see other tea times and pretty tea dishes. I'm sure your meeting went well with tea, a nosh, and good company in the mix! Hope you're enjoying our cooler days on the lonesome prairie! Thank you for sharing life at Linderhof on today's post. . .because sometimes life is busy with meetings! Your setting looks pretty. I love your teapot, cup and saucer. The shortbread looks very tasty too. Very pretty, what a nice welcome! I never tire of your pretty tea settings and thinking of the ritual that goes along with them--whether full blown or simple. I, too, love Walker's Shortbread. I love your blue and white tea set. The tea cups and saucers are just beautiful.You have set such a lovely tray too. Martha I love all your Blue and Whites, wish I was near you so I could visit for one of your fabulous teas. :-)Love, love shortbreads. Very cosy setting and I can feel the warm it gives! love the teaset..
Beautiful. There is something about tea that puts everyone at ease. (I love Johnson Bros. anything!) Happy Tea Day! How divine! Looks like a perfect English tea. Love your tea set. I made a pot of Earl Grey just yesterday afternoon and thought of you. It was a rainy dreadful day so afternoon tea was just the thing to brighten the day. On Giada's program yesterday afternoon she made some madeline's that were a little different. Made using a cake mix with other fresh ingredients added and they sounded so good. I am making a copy and will send it to you. I am a shameless copycat, and used "our" china in my Tuesday post as well. I love the Indies tea pot -- what an adorable shape -- but they are so expensive now! Not in the budget for awhile. Love your Indies pattern! I also love the Walkers shortbread! A lovely tea post. Please stop by and have tea with me too; would love to have you. 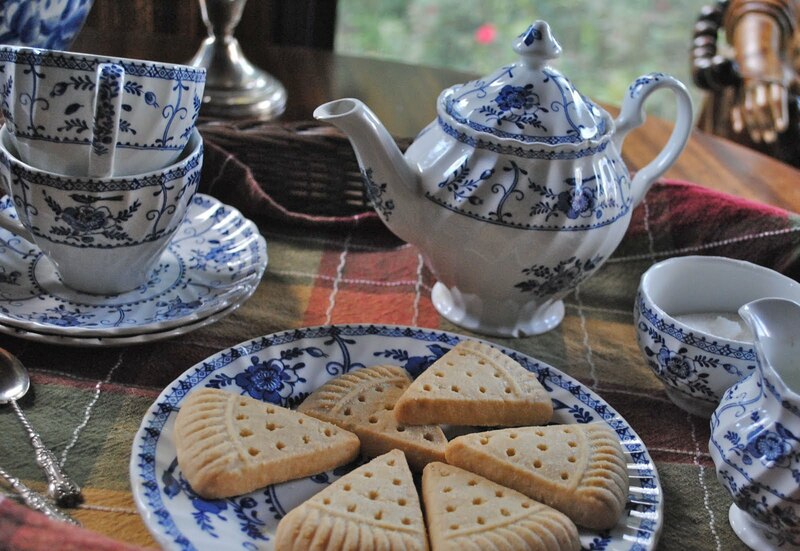 What a pretty tea tray - it doesn't get much better than blue china, shortbread and tea. Walker's is my Scottish Step mother-in-law's favorite! Such a lovely tray of Tea! Just love the china!!! the shortbread looks delicious! What a great way to have Tea with a meeting! I would love to be there! I hear your having Tea with Cass today. Lucky you and Cass! Thanks for joining me for Tea Time. You had me at "Walker's Shortbread." I love those cookies. 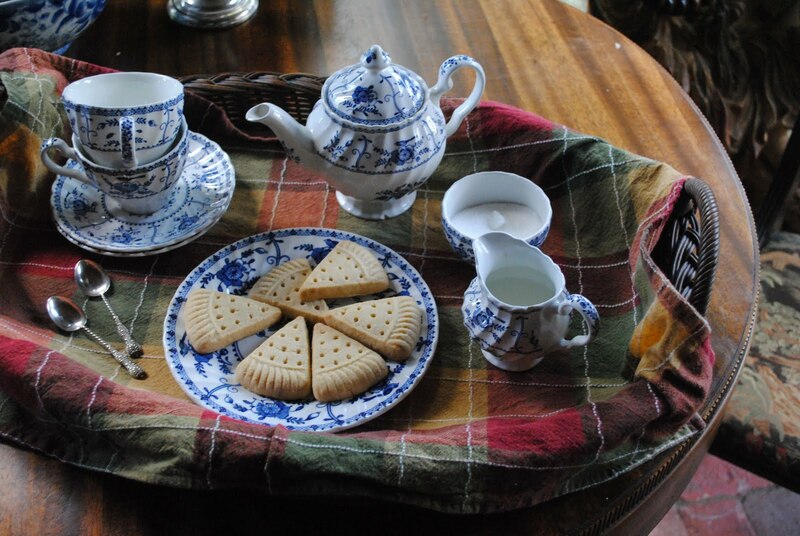 Your tea tray looks lovely and what could be better than tea and shortbread in the sunroom? I'll have to search for some Walker's shortbread on my next trip to Marshalls or Ross.